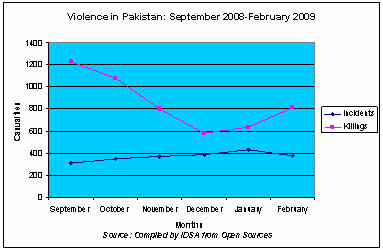 The number of violent incidents in Pakistan increased from 309 in September 2008 to 346 in October 2008. 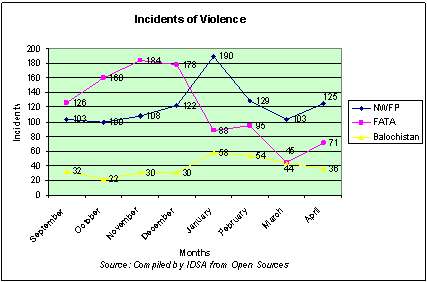 Yet, casualty figures decreased from 1342 to 1081.1 This shows that Pakistan’s security forces have succeeded in controlling the level of violence, even though current levels are still unacceptably high. 582 suspected militants, most of them from the North West Frontier Province (NWFP) were also arrested by the security forces during the month, in military operations as well as during searches in various areas. 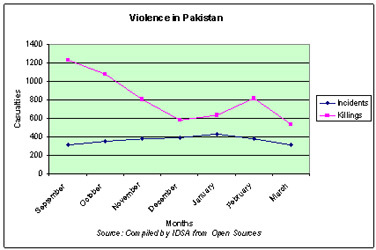 Although September coincides with the holy month of Ramzan in the Islamic calendar, the violence in Pakistan during the month surpassed that in August, which itself was the most violent month. Despite the fasting and sanctity accorded to Ramzan in Islam, it is also associated with Shahadat (martyrdom) and people laying down their life during this holy month are often considered Shaheeds (martyrs). 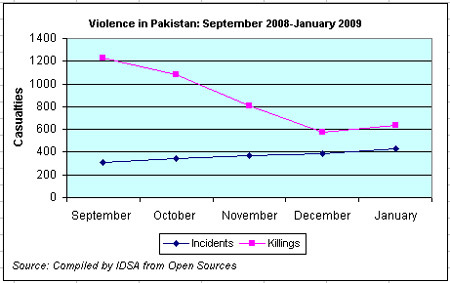 This probably explains to some extent the extremely enhanced level of violence in Pakistan during September 2008 and why various Ramzan ceasefires negotiated in August and September floundered.